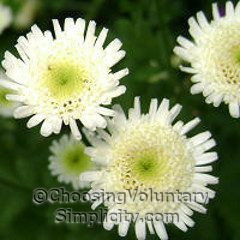 Feverfew, or Chrysanthemum parthenium, is a biennial or perennial herb that is native to parts of Europe and Asia. 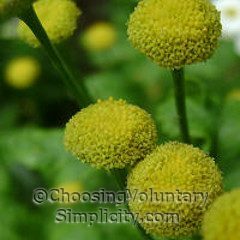 It requires very little care and will thrive in ordinary garden soil in full sun to partial shade. 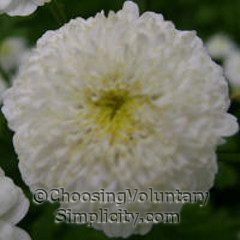 Plants can be started from seeds and mature plants can also be divided, but since feverfew will self-sow enthusiastically, you may want to dead-head most of the flowers to keep this herb under control. 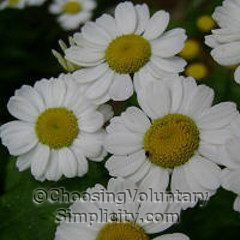 The most recognizable feverfew flowers look like small daisies with their white petals and yellow centers. 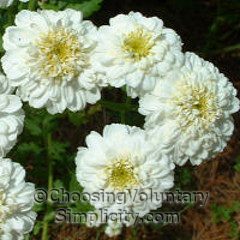 However, I have found that if you plant several packets of purchased commercially-grown feverfew seeds, the results may be quite unexpected. All the seeds I planted were labeled as feverfew, and all the leaves look exactly the same, but the flowers look very different. 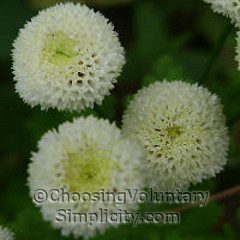 To date I have at least seven different-looking feverfew types that range from the typical daisy feverfew in two sizes to round balls with tubular florets and no petals. This year there is even a group of feverfew plants that are producing small yellow balls, half the size of the white balls I just described. 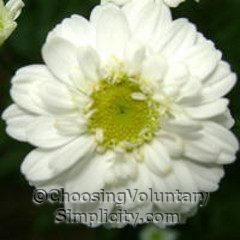 I also have two types of double-flowered feverfew and some with irregular-length thin petals. I have them all growing in the same area, and I find it very interesting to compare the various types. Feverfew has a long history of use as a medicinal herb. For a while it was thought to be effective against fevers, but more recently it has been used as an anti-inflammatory for arthritis and as a remedy for migraines. Many people believe that eating a few small feverfew leaves each day will prevent a reoccurrence of headaches. Feverfew has a very pungent odor, and this is thought to be pyrethrin, which may explain why feverfew is also used as an insecticide and as an insect repellant. Supposedly bees will not come near feverfew or other plants if they are planted near feverfew, but certainly this is not true in my garden, and many times I have even seen bees on the feverfew flowers. 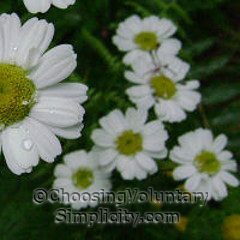 nice article about feverfew..did you get the seeds randomly or order special kinds. I write a column about garden things and this week I was going to focus on Feverfew, finding much less than expected in my reference books with the exception of Garden Witchery. 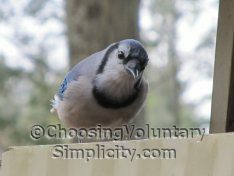 It always surprises me when things I consider common in my garden business are actually rather hard to find. Elizabeth, all of the feverfew seeds I bought were just the ordinary packets in the seed racks. 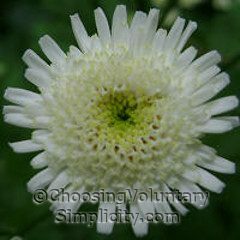 As I remember, all of them just said “Feverfew.” I was surprised to come up with so many different types, and I have tried since then to find seeds for the various types and have been unable to. I didn’t dream that there could be so many kinds. Thanks for these wonderful pictures. They clearly show the differences. Wonderful post. 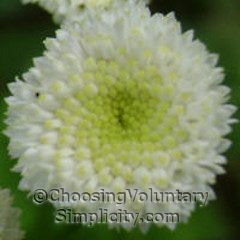 I’m a great believer in preventing migraines with feverfew. I dry the leaves and have found them to be quite effective. I purchased seeds from an organic dealer. My feverfew has very tiny lacey flowers with no yellow center. I am wondering of I actually got Feverfew or if the wrong seeds were put in the package?